The newborn and mother on board the boat. Photo: Bald Elm. A two-day-old baby was rescued from aboard a boat carrying 311 migrants off Malta, before Spain intervened to break a brewing diplomatic dispute between southern Mediterranean states. In a short statement, devoid of any details, the Armed Forces of Malta said the baby needed "medical assistance". The evacuation took place 57 nautical miles south of Malta with the help of an AFM helicopter. The baby and the 23-year old mother were safely flown to the Air Wing Base and then taken to Mater Dei Hospital by ambulance. The statement did not give any details about the number of people on board the boat, how long they were travelling for, or where they were heading. A video posted on the NGO's page. But a post on NGO Open Arms Facebook page shed more light on the case and said more than 300 migrants had been saved and were taken aboard its rescue ship. "That's how the night started at open arms. 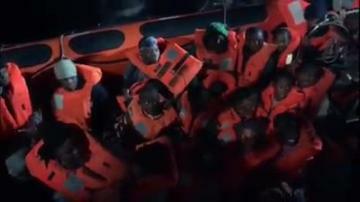 More than 300 people saved from certain death at sea. No port where to disembark and Malta has refused to give us food it is not Christmas in the Mediterranean. We are in urgent need of provisions," the NGO said. A spokesman later told Times of Malta that the AFM said they could not provide food due to the weather conditions, "even if there were no problems at all at sea". A source said the infant was at Mater Dei Hospital in a "stable" condition. On Saturday night, El Pais reported that the Spanish government had authorised the vessel to enter Spain. The trip would last around four or five days, depending on sea conditions. The government later said all migrants were intercepted inside Libyan search and rescue area off the Libyan coast. 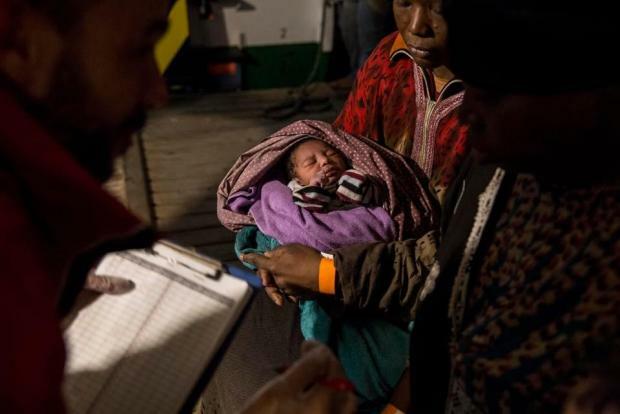 Malta conducted a medical evacuation outside its area based on humanitarian grounds, going beyond its legal obligations to rescue a two-day old baby and the mother, a spokesman told Times of Malta. "The NGO vessel has stated that it has enough provisions on board for more than two days therefore enough to proceed towards his home port. However, the master chose to proceed south instead and keep loitering at sea waiting deliberately for the situation to deteriorate. This irresponsible action from the NGO vessel deteriorates further the situation and clearly shows that the master is deciding himself contrary to every convention the port of disembarkation." The vessel has enough supplies to proceed or close distance towards his home port in Spain. Italy's right-wing deputy prime minister Matteo Salvini said in a tweet: "Ship calls an Italian port after the refusal of Malta (which rightly picked up a woman and a child). The Italian ports are closed! For the traffickers of human beings and for those who help them, the party's over." ??? ?Nave Open Arms, Ong e bandiera spagnola, ha raccolto 200 immigrati, chiede un porto italiano dopo il rifiuto di Malta (che ha sbarcato, giustamente, una donna e un bambino). Per i trafficanti di esseri umani e per chi li aiuta, la pacchia è finita. Italy and Malta have constantly sparred over who should take migrants spotted at sea in the Mediterranean.